We are in the process of doing a MAJOR reorganize. We , meaning mostly my mom and me, are working to make life easier by getting my house in order. I'm a victim of doing too much, raising 4 young kids, homeschooling, running a business, and my hobbies keep me pretty busy. I probably could fill my day with nursing sessions and changing diapers alone, but I like to try to do so much that I can't function at all. We are working on the basement, library, morning room, playroom, and other smaller areas of the house. I worked a lot in the morning room this weekend and got it to functional level. I still have a lot of labeling to do and definitely some decorating. I'm reupholstering the adult chairs as well as changing the curtains, and possibly painting some of the tables or chairs, or maybe just sanding and staining, I haven't decided yet. Although, it's not very pretty, I'm still excited that it's somewhat clean and functional. The girls were pretty happy to have a workspace back. I thought I'd take pictures and blog about it because it may never be "clean" again. As you can see, I have a separate Kids table and Adult table. I am hoping that this will still allow us to sit down at a table if the kids leave all their stuff out, but I'm sure that will never happen. Dave and I went to an auction recently. It was a school auction and it lasted all day. We came home with that kids table ($1), a few chairs ($5 a piece), A kids computer desk ($4), a cubicle shelf ($30), 2 upholstered adult chairs ($0.50 a piece), and a nasty sunburn. We got a few other things, I'll show you later. I have bins for everything. I would have loved to go buy all cute matching bins, but I'm trying to not spend much money on this project, so I've got various shapes and sizes of bins. Each girl also has a nice large bin for finished projects. The computer desk will have it's own chair, but Heidi is borrowing it because I didn't feel like getting the rest of the chairs out of the garage yet. As I typed this the girls finished up the projects they were working on and... Cleaned UP! Now, if only I could get them to do that every time. Okay it's actually, THE ONLY ONE. Diana was afraid of the photographer, so she ran screaming from the room after this was taken. Oh those scary photographers... Sorry about the poor quality, I do not have a scanner, so, if you couldn't tell, I took a picture of the picture, nice, I know!. Karilyn looks scared, Heidi isn't looking at the camera, Diana is actually looking, but Hannah has one eye open and one closed. So I declared us all to be pirates. So anyway, back to the pirates. I had a dream two nights ago that I was on ancestry.com and I was doing research on the Yoho Family line. Well, apparently, as I discovered in my dream, the name Yoho originated because my ancestor, Johannes Michael Yoho, was a pirate. "Yo ho, ho ho, a pirate's life for me." "Jo ho, ho ho, a pirate's life for me." What? Ken's a pirate? My kids black out their doll's eyes with a sharpie and pretend they arrrr pirates? Well, we must be pirates then! 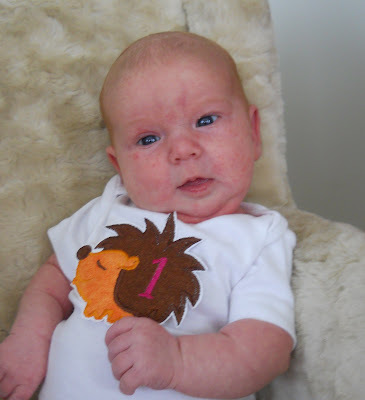 I'll leave you with this adorable picture of my ONE MONTH OLD! Yes, only a true pirate wouldn't blog about her birth or anything or even mention her on her blog until she's a month old. ARRR! I have been dreaming of a fairy garden for the girls and myself for more than 2 years. It's FINALLY "done". Although, it will never really be done, because I'll always be rearranging and adding new plants and things. I bought each of the girls a fairy that looks just like them a week ago, but two of them are lost already, big surprise. So I added some dinosaurs instead, it's now a fairy-miniature-prehistoric garden. The garden has a sand box, what fairy wouldn't want a sand box to play in. It's also got a mini swing, for all your fairy swinging needs. Check out the bird bath, it's there for all of the miniature birds that come to visit our garden. There is even a tooth fairy house. Did you know that tooth fairies are smaller than regular fairies? They are because the two little houses are smaller than the rest of my fairy things. They put up the fence to keep out to dinosaurs, they don't particularly like dino teeth. Too sharp! We put the garden behind our garage in kind of a shady protected area, I hope this helps keep the fairies' environment safe from the elements, although, I know it will never be safe from the elements who are my kids. "It's for them", "It's for them", I'll keep telling myself this. The good thing is though, if it gets "messed up" it's so fun to rearrange anyway that I don't think I'll mind too much. There's talk of extending it next year, to fit in more fairies, I mean more fairy things. Dave would also like to add a water feature, perhaps a stream and a pond, you know for all the little miniature fish. The girls got new swim suits. I was inspired by this blog post over at Made. Thanks for the inspiration! Her suit in better than mine, but I had sooo much fun playing with the ruffle fabric she used. I also have a serious addiction to spandex world! I have purchased several yards to make swim caps for my store, but I've also enjoyed making suits for the girls. You can never have too many swim suits, especially since they will be in lessons again this summer four days a week. They, of course, didn't get them on Easter morning because I didn't have them finished. Do I ever have anything finished on time? I finished them on Easter evening. They got matching caps as well. I'm going to experiment around with putting a flower on the cap. As promised, I've now completed 2 out of 3 of the fabric piles I showed you in this previous blog post.I used a different fabric for Karilyn's than that picture showed, because Karilyn kept picking pink ruffle fabrics that were impossible to match, hence the yellow used in this one and more trips to spandex world. I've finally found a fabric to match the original pink, so that will be made into a suit soon. and I'm sooooo glad I did. Yesterday I posted that I had a paint color picked out. Apparently, I didn't. We began painting which is always fun with a toddler, who thought it would be a barrel of monkeys to bang a screw driver against the window, and two "big" kids who want to help. At first I thought, I'm not sure I like this color. We painted more, I was more unsure. We painted more, I HATED it! It was very hard to stop because we had about half of the room done, but I talked to my sister, and with her help, I determined that we needed to change the color. I was going for an aqua. I liked the color, it was just too much... too aqua. It didn't even want to look at the wall. It was not fitting into my idea of a fun, but calm and relaxing room. It seems to appear fine in the picture, but in the room, it made me feel unhappy. So, Dave went back to Sears and got a few more samples, and since I had something to go by, I picked a color in about 30 seconds. The color was called "Slightly Aqua". Now, I've never picked a color based on the name before, but "slightly aqua" was exactly the kind of thing I was looking for, and it looked so nice with everything. So, Dave, again, went back to Sears. They didn't have the base to mix it. So he went to the other Sears, it wasn't on sale there. Great! He convinced them to give him the sale price anyway. Now it was about 4:00, I really wanted to be done, and we would have been if I stuck with my original color, so that was hard, but immediately liked the new color! It looks great, I absolutely LOVE it! I think I'll wait until to room is all done to show you the finished project, it will be more dramatic that way. I am on my way to the best sewing room ever, at least I have to think that because this is sooooo much work, and picking colors for walls, countertops, etc. is hard. My pregnant brain can't handle much more of this. Most of the contents of my sewing room are all piled into the living room. I'll never find anything again! In the process of moving the hutch, Dave took the top off and put it in the morning room. Karilyn and Heidi set up a "pet shop" with it. Can you find the pet that ~kind of~ doesn't belong? "Why oh why is the cat locked up?" I need to do some fun things this week, to keep myself from a bad mood. I've found something very fun! Sewing Swimsuits for the girls, complete with matching swim caps. I also need to list a bunch of caps in my Etsy shop, which I have begun doing. Help, I'm out of control. I've let them pick a few fabrics they like and I have plans for a couple swimsuits for each. So far I've got 3 done. I sewed one on Monday, one on Tuesday, and one on Wednesday. Quick and Satisfying! Heidi has been wearing them all day everyday. I don't know if you can tell, but there is a seahorse appliqued on the suit and on the cap. He needs an eye still, but I was fresh out of crystals, so he'll receive his eye later. When I saw Camo spandex, I knew I HAD to make Heidi a "deer hunting" suit. She loves it. I was right. I also finished with MY rag quilt. I've always loved these fabrics so I decided to make myself a rag quilt. It's mostly made of minkee and it's soooo soft. You may have recognized these fabrics from a few posts ago where you were supposed to guess what I had planned. Well, no one guessed, but I'll share anyway. This quilt is also the color palate/theme of my sewing room which we are redoing. I'm very excited about this project, but equally overwhelmed. My room is torn apart right now and I can't find anything. I am married to my best friend, Dave, and I am a mommy to FOUR amazing little girls, Karilyn (9), Heidi (6), Diana (3), and Hannah (1). I am also the owner of The Applique Place, My Little Hedgehog, and Froggie's Swim Caps.